First I apologize for not blogging. Boris has been away so I was doing double duty at FX360.com. He’ll be back tomorrow so I promise more blogging! If you know me, I love all things Apple and I am addicted to my iPhone. 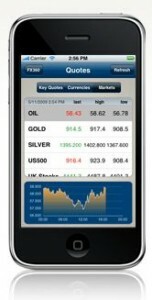 So therefore I am very excited to announce that FX360 has launched an iPhone App! 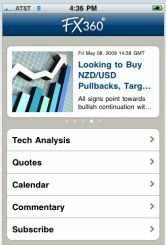 Forex traders using Apple’s® popular iPhone™ now have the forex market at their fingertips. The new application — available now at the Apple® iTunes® store — offers all of the best features of FX360.com, but in a fast, portable iPhone™-based format. 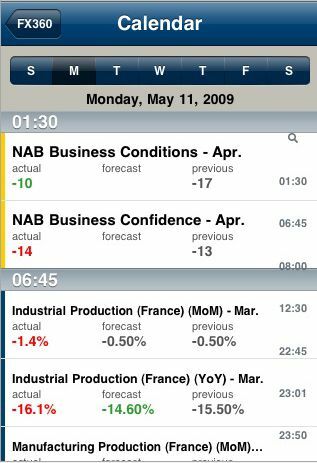 -- Real-time economic calendar with updated numbers, descriptions and historical data.